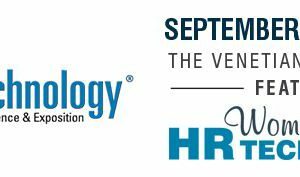 The 2017 HR Technology Conference kicked off on Tuesday morning with the second annual Women in HR Technology summit. 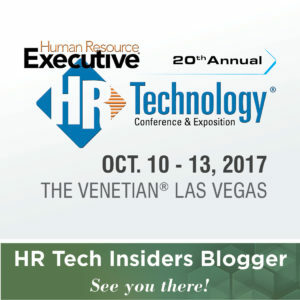 Back bigger and better than ever this year – in a much bigger conference space to alleviate the overflow issues from the unexpected popularity of the inaugural event last year – the goal of this summit is to address questions such as how do we attract more women into tech and HR tech roles? And how do we help those in the field overcome the challenges of working in a historically male dominated field to thrive and ultimately grow into leadership roles? I’ve said this before, but one of the reasons I really like this summit is that I truly believe that although the issue of promoting more women into leadership roles is certainly a prominent one in technology fields, I believe it also transcends tech to impact many industries. I work in the grocery retail industry and historically that has been fairly male-dominated; I’m sure we are not alone. More women in leadership roles is good for all business, and it’s something that should be top of mind regardless of the industry in which we work. And that could mean thinking about how we as women can help to promote ourselves, or how we’re helping those around us or in our companies to grow and thrive. At that point Trish mentioned Women of HR, the blog that we founded with a few other women in 2010 and have collaborated on together since then. She kindly recognized me as the woman who now runs the blog, and talked about how it has helped to create a community for women (and men) to talk about issues important to women in business. She pointed out how something organized and developed completely outside all of our day jobs, something done voluntarily with no monetary compensation, something that we had the power to just do on our own, has help to create a resource and community to support women in business. I realized in that moment the truth that we ALL can have an impact, no matter who we are or where we work or what our official job title is. Through my collaboration with Trish on Women of HR, she has helped bring me along. She has mentored and encouraged me to try things, even things I thought I couldn’t do or that scared me. But at the same time, Women of HR has helped other women too. So through my involvement with it, I’ve also had the power to make an impact. Me, who started listening to this panel thinking I had so much to learn from them, is actually already doing something to help. So it may be big, it may be small. It may be within the confines of our own company, or in the form of something we do on our own time. It may help our own development at the same time as helping others. No matter what it is, we can all do something; we all have the power to help move the needle, in our own ways, one step at a time. And that was a powerful realization. What are you doing, or what can you do, to promote yourself or other women around you? Jennifer Payne, SPHR, SHRM-SCP has almost two decades of HR experience in employee relations, talent acquisition, learning & development, and employee communications, and currently works in talent management in the retail grocery industry. She is one of the co-founders of Women of HR, and is currently the Editor of the site. You can connect with her on Twitter as @JennyJensHR and on LinkedIn. Great article! More power to the woman in HR out there. Thanks for reading and taking the time to comment! I appreciate it and glad you liked it! Human Resource on Is Perfectionism Required to Be Successful? Nettl Business Store on Can You Meet For a Cup of Coffee?